This kit will replace many fixings attached to frame including: Front Fork Pinch Bolts Handlebar Pinch Bolts Lever Clamp Bolts Fairing Bracket/Brace Stay Bolts Footrest Hanger Bolts Left Heel Plate Bolts Right Heel Plate Bolts Silencer Bracket Bolts Rear Hugger Bolts Chain Guard Bolts Included in this 61 piece kit are: 5 Stainless Steel Pan Head Bolts 19 Stainless Steel m6 Button Head Bolts 2 Stainless Steel m6 Cap Head Bolts 5 m6 Nylock Nuts 1 m6 Washer 18 Stainless Steel m8 Button Head Bolts 8 Stainless Steel Cap Head Bolts 2 m8 Washer 3 m8 Nylock Nuts This kit features high quality stainless steel cap and hex flange bolts that resist corosion and look great for years. 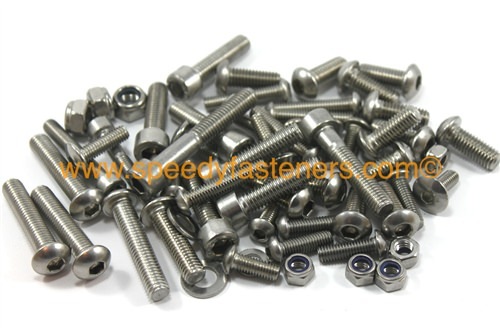 All button head and cap head bolts use an Allen key tool for fitting. This kit will fit Yamaha R1 1998-2002. This kit is made of high quality products at low prices. If bought from Yamaha, these parts would cost you much, much more, and they won't even be stainless steel! 100% money back guarantee if you are not happy with the kit.